Here is the Chicken ChaNp I made to go with the Biryani for Thanksgiving. To be honest, it tasted much better with Rotis. I followed the same recipe as I do for Mutton ChaNp (click here for mutton chanp recipe), with few minor changes. Though chaNp means the rib portion of the meat, since I used chicken I used a whole chicken cut into 4 pieces. 1. Clean and wash the chicken pieces. Dry them with a paper towel. Make slits on the flesh. 2. Dry roast green cardamom, black cardamom, cloves, mace, nutmeg, black pepper, cool down ground to powder. 3. In a bowl mix together garlic paste, ginger paste, grated onion, yogurt and freshly made spice powder. Add salt, red chili powder, turmeric powder, rose water, kewra essence and mix well. Add the chicken pieces and rub the marinade well to the meat. 4. Marinate at least for 4-5 hrs or overnight. 5. Take a non stick pan. Heat the ghee. I also added oil with the ghee. 6. When the ghee is hot add the marinated chicken pieces. Do not cover. Cook on high heat for 8-10 mins. Reduce heat and cook for 15-20 min. Keep turning the pieces in between. 7. By this time oil will separate from the spices. Keep cooking for 10 more min on high heat. Check the seasoning and adjust accordingly. 8. Serve with nan or rotis or biryani. 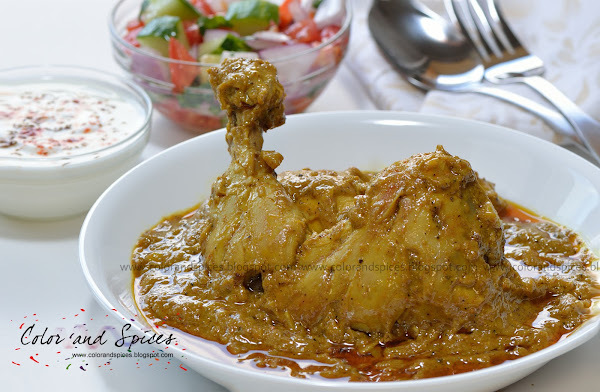 wonderful clicks.you have a lovely blog.this is a must try recipe.will try soon. happy to follow you.will be glad if you follow mine. i tried this with some little twist ,it was fantastic.thanks for sharing. Thanks Meena for trying it. Ilish macher jhol....Hilsa with vegetables..